The Credit Suisse brand reflects our strong heritage and ambitions that have guided our pursuit of value creation and protection for clients since 1856. Our brand is an expression of our longstanding commitment to helping clients achieve their growth ambitions, build and expand their businesses, and meet their objectives. We are dedicated to our clients – to understanding them; creating solutions for them; and connecting them to the right resources. For more than 160 years and in more than 50 countries. Across private banking, wealth management and investment banking. Our logo symbolizes the transformation of Credit Suisse into an integrated global bank in 2006, when the areas of Private Banking & Wealth Management and Investment Banking were combined under a single roof, as well as our international orientation, heritage and goals. The sail-like symbol echoes the pioneering spirit of the entire bank and the heritage of our business. The logo has evolved throughout the company's long history to compliment its constant growth, the founding of new branches and the various mergers and acquisitions that have taken place since its foundation in 1856. Founding of the Schweizerische Kreditanstalt (SKA) in Zurich. The First of Boston Corporation is established as a subsidiary of The First National Bank of Boston. First foreign branch of SKA (New York), new logo. For the first time, the SKA logo comprises the bank's name together with an image. The anchor symbolizes trust. The famed Wermelinger cross is introduced as the logo. It was selected as the winner of a widely held logo competition. The red, white, and blue logo is introduced. The first collaboration between SKA and the First Boston Corporation follows two years later. SKA takes on a majority holding in the First Boston Corporation. CS Holding becomes Credit Suisse Group, holding company of Credit Suisse and Credit Suisse First Boston. Start of Credit Suisse as an integrated, global bank. 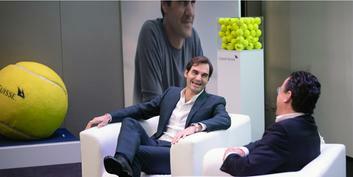 Credit Suisse entered into a long-term partnership with Roger Federer in 2009. 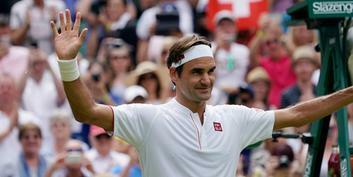 This world-known tennis player with Swiss roots is an ideal ambassador for our brand as we share a number of values: wide international appeal, the desire to excel and a distinct sense of quality. This is complemented by a high degree of responsibility toward society at large. Visiting Credit Suisse. The highlights.